Be attentive to little things. and often, they matter the most. Some think this is the present moment. After all, you are thinking about what to do “right now”. And yet, this isn’t quite being present. Being present is a state of clarity. Being present is connecting with our emotional and spiritual self. We often lose sight of this in the chaos of our day, which is understandable; but not optimal. We need to step back and worry about ourselves more than our work. Our relationships get affected as well. Think of some family and friends that you cherish your times with, yet you haven’t seen in months. When you do speak, each of you provide the same,”Hey, I know how it is. School, work and life are just too busy now. We’ll get together at some time, just hope all is well.” Well, too often that’s all people ever say to each other. All too often, we think how it would be great to see them, but we don’t act on it. That’s why I made counteracting this one of my 2014 goals. So what can you do to better your situation? For this week, I will discuss the Self-Focused approach. As I discussed in my post about gratuities, we are social beings. Therefore, relationship-focused and socially-focused activities (to be discussed in the next two weeks) can do a great deal for helping us connect with ourselves, while providing emotionally and spiritually sustenance. Essentially, each of these three approaches overlap in some way. That’s why working on all three is important; exponential growth! Drink green tea. I got a new Chinese teapot from Chinatown (Philadelphia) recently that I’m putting to use. It makes just the right amount, and it tastes great. Also, it sets the mood more than heating up a mug! 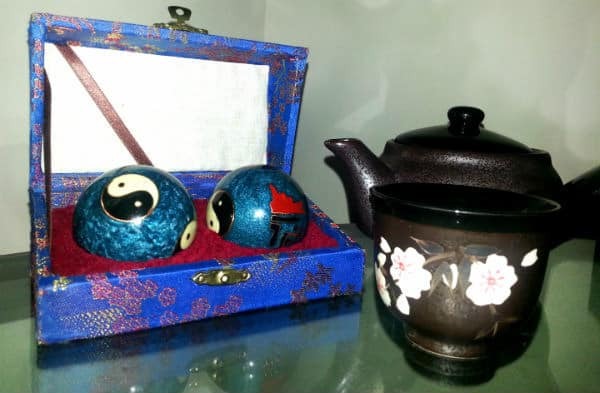 Use my Baoding (Chinese Medicine) Balls. They each have a bell in them — one with a low resonance, and one with a higher chime sound. All you do is rotate them, but the simple and repetitive task is calming. When I do these things together, I lose myself in my thought. At first, I stay clouded thinking about school, work, projects and various other thoughts. After a few minutes though, all of my anxieties release. In this moment, I am present – a state of mindfulness and clarity. This is a peculiar routine, of course. But, such routines are not uncommon. Tim Ferriss’ had a recent blog post about daily rituals which was very interesting. A book called “Daily Rituals” by Mason Curey outlines nearly 200 routines that some of the greatest minds have implemented in their lives. It’s one of the next few on my bookshelf to read! The key to finding these routines is experimentation. You can’t know what works, or doesn’t work, until you try. So, my suggestion is to start trying different routines now. Identify the time of day that you need to relax, and target that. It might need to be physical; or maybe you just need to sit in silence or to calming music. Whatever you think of, try it. Don’t just consider it, make a point to try. Also, you can try buying the Daily Rituals book! I make no money from you purchasing it, so I’m not biased, but it might spark some habit building creativity.